February never feels like a short month until it is the last day of the month. That is how I always feel, anyways. Anyone else ever feel like that too?? Did any of you sign up or receive the new subscription Wool Box from Primitive Gatherings? 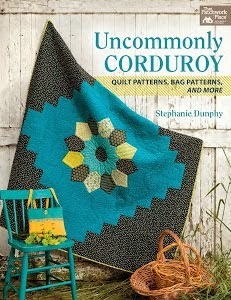 It is FULL of goodies (wool projects, thread, candy, recipes...and so much more) and fun! I love receiving happy mail! One of the wool goodies included was a stack of 5" wool charms. My girls and I made some wooly heart bowl fillers. The box includes oodles of goodies. 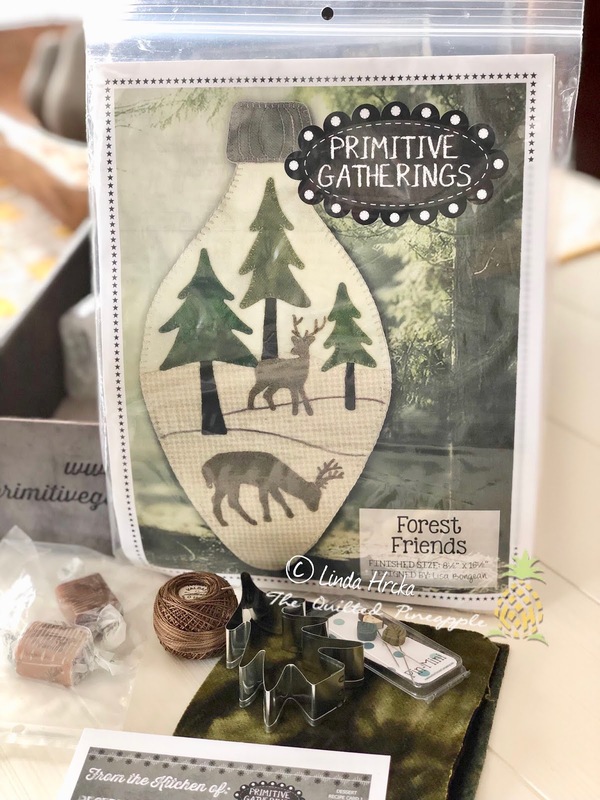 I plan on prepping Forest Friends mat for an upcoming trip. 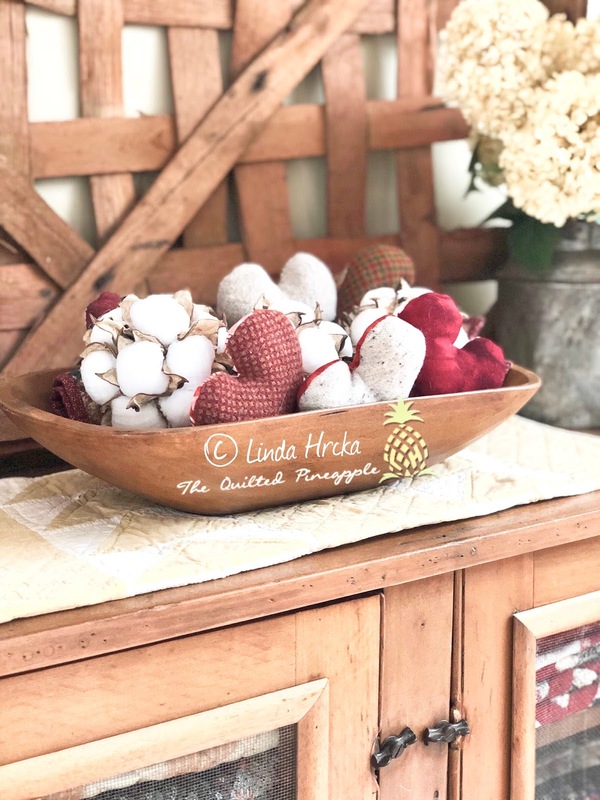 That is what I love about these wool projects, they are so portable! You cannot see it, but there is a pincushion kit too that you can use with a ruler box included. I have already put the ruler box to good use on my longarm cart. It holds all my partially used magnetic bobbins. 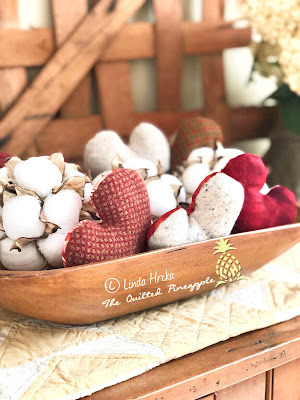 Wooly hearts were easy to make. I just picked out the 6 wool charms out of my pack that I thought would work best for hearts. I will save the green and black charms for something else. I guess you could make black and green hearts too if you wanted (chuckling). I printed a free printable heart template off the internet. I then traced it on a leftover Moda 5" charm I had in my stash. Stitched the hearts on my sewing machine, being sure to leave an opening for stuffing. Girls stuffed them with leftover batting (no shortage of that here). And then we hand whipped stitched them up. 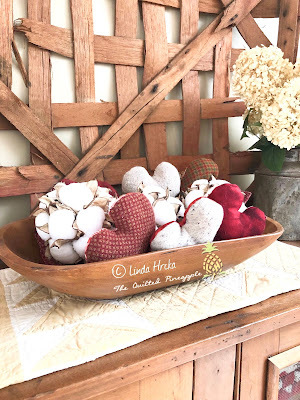 Easy and fun project to make with the wooly charms. 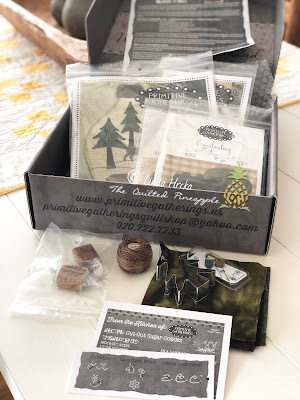 You can order your wool box from Primitive Gatherings here. 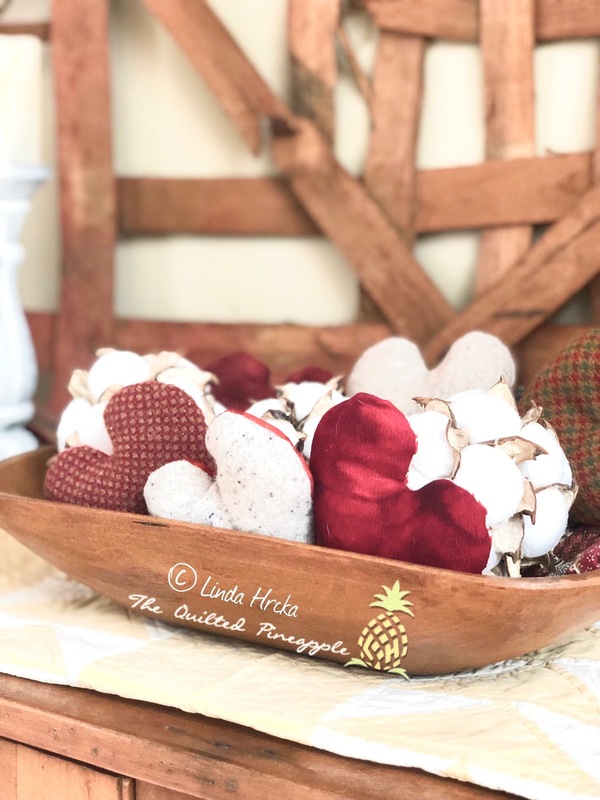 I think I will use the hearts for Christmas and summer decorating with red, white and blue as well. I am looking forward to making the rest of the projects in my box. 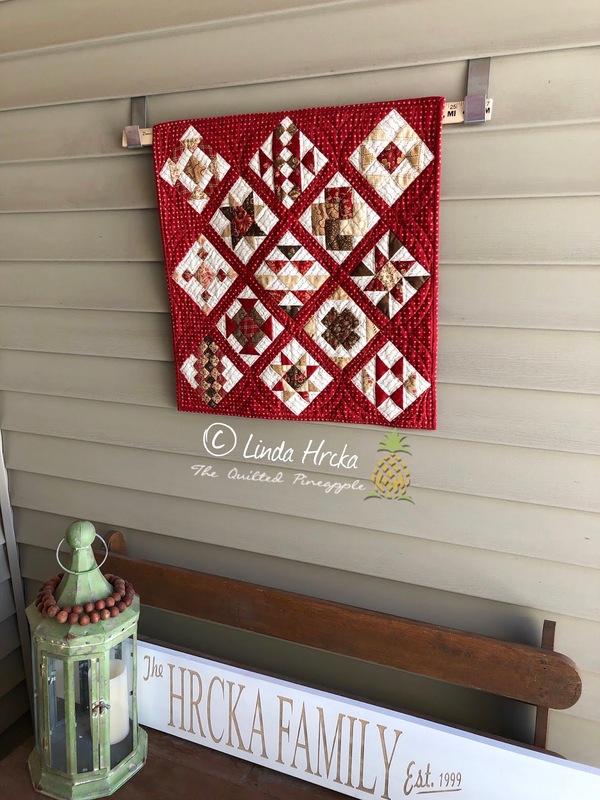 I received many messages, emails and comments inquiring about how I hang my quilts outdoors. I now have them listed in my shop for purchase here. Yay! They are easy and inexpensive. No holes, nails or adhesives required! 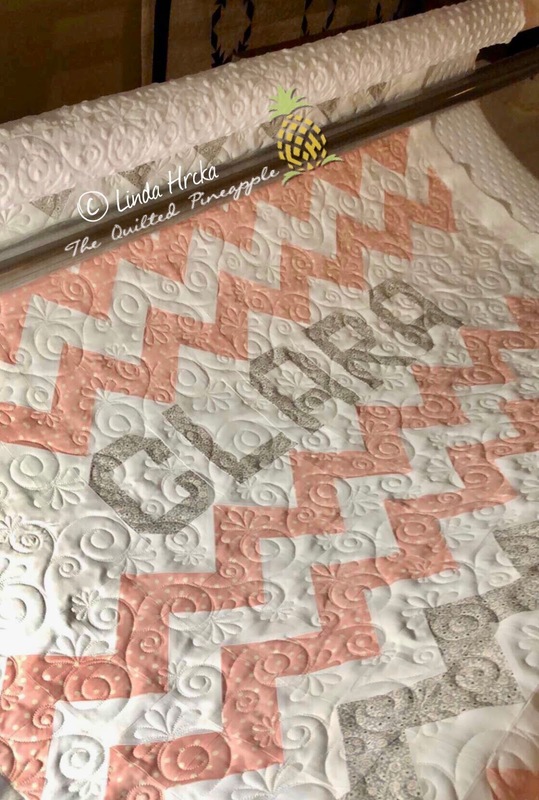 I use a yard stick in-between the hooks to hold my quilts, but anything similar would work. I use yardsticks ALL the time! I am fortunate to have an abundance of them from my Father-in-Law's business before it closed years ago. 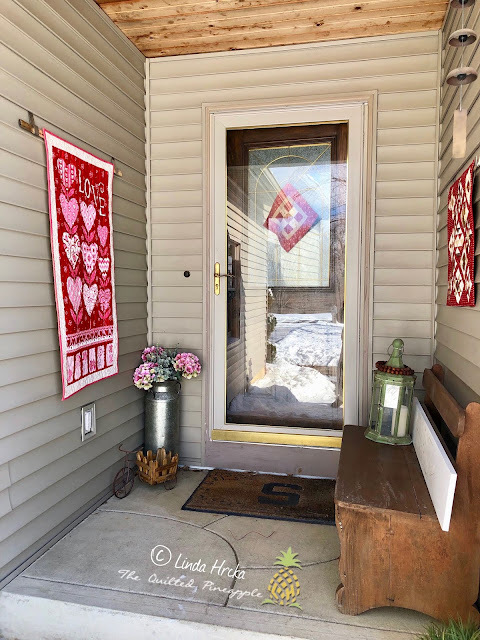 In addition to my quilt panel, I also have my quilt called Sample featured on my porch, pattern by Carrie Nelson. 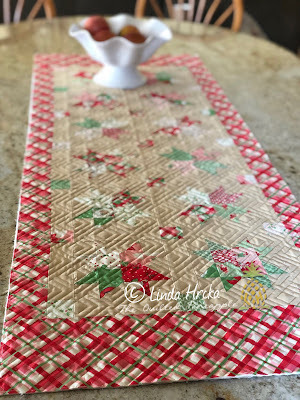 Using two mini charm squares from Moda. 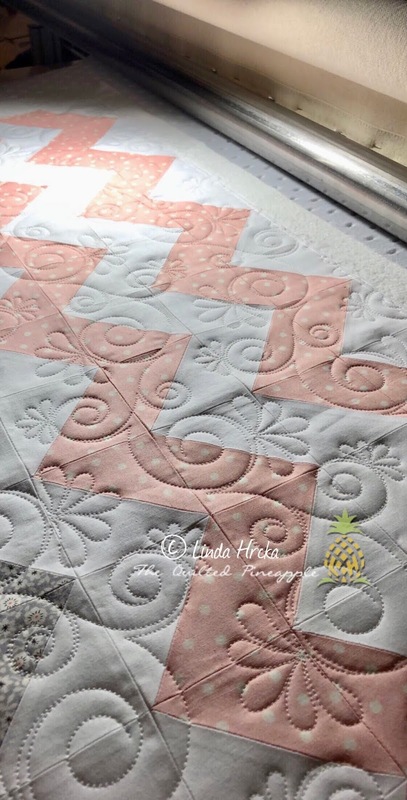 I custom quilted using my QP templates and rulers. 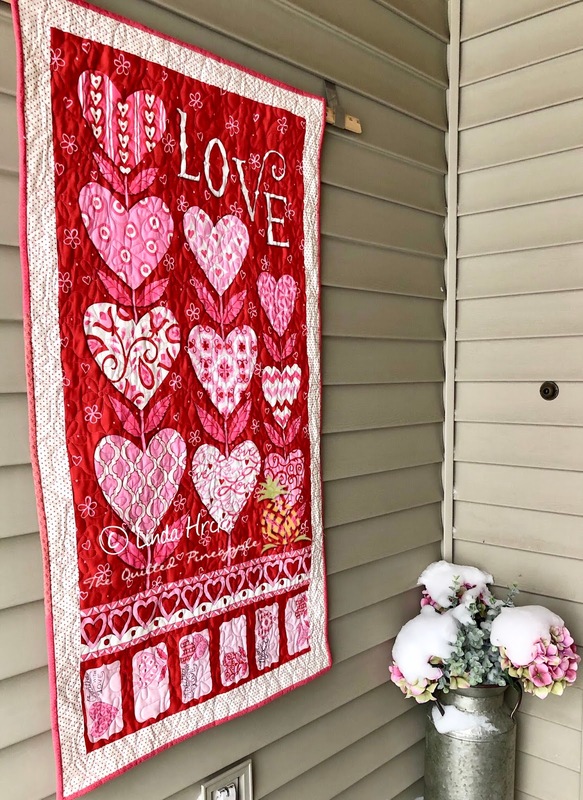 It is winter and this quilt will only hang in February, I am not too worried about sun damage...it's Michigan...I haven't seen the sun in days! Plus on this side of the porch is a bit more protected from the outdoor elements. 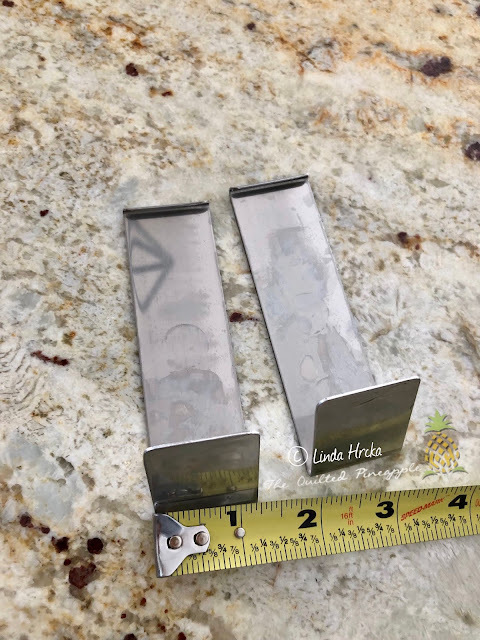 A set of two outdoor vinyl siding hooks for quilts and more. An easy way to decorate with your quilts outdoors without damage! Designed exclusively to use with vinyl siding. -a set of two stainless steel hooks. -holds up to 12 pounds. -no holes, no nails and no adhesives required. 1. Rock hook between vinyl siding panels. May need to wiggle it a bit to get the hook in. 2. Once in place, you can start decorating. 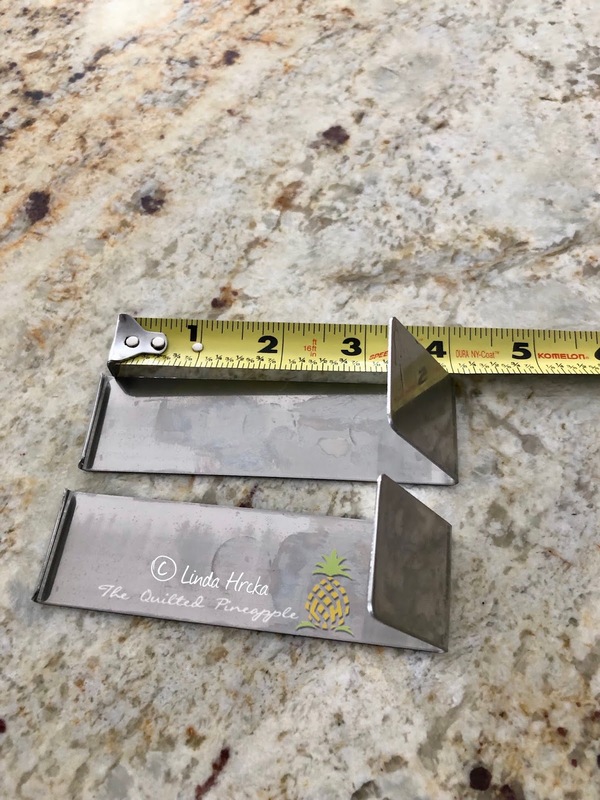 ***If purchased with a ruler/template order, we will refund the shipping charges back for the entire order for FREE shipping. Happy Valentine's Day everyone! 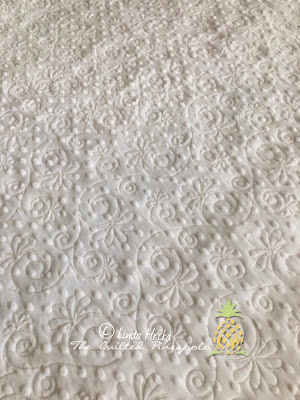 So I have a new found love for pre-printed quilt panels. The reason...I love to use them on my front porch. I love to hang quilts out there, but unfortunately because they are exposed to the elements (as you can see from the snow on my hydrangeas), it takes a toll on their appearance. 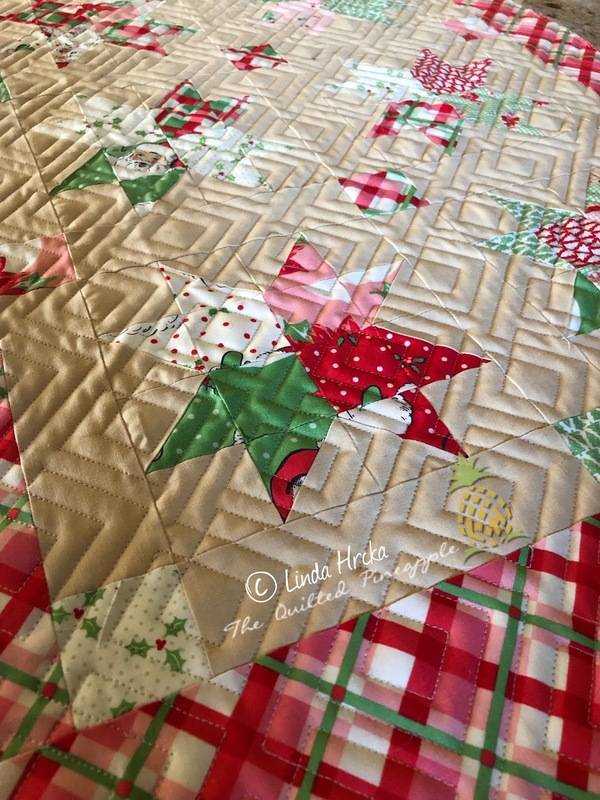 Hence, a quilt panel is perfect! They are cute and inexpensive. Typically I add a border, quilt it up, binding, hanging sleeve and viola...I have an almost instant quilt that I can decorate with and it won't break my heart if it suffers from the outdoor elements! Love Grows panel is from Deb Strain's line of Love Grows line of fabric from Moda. Perfect for February. 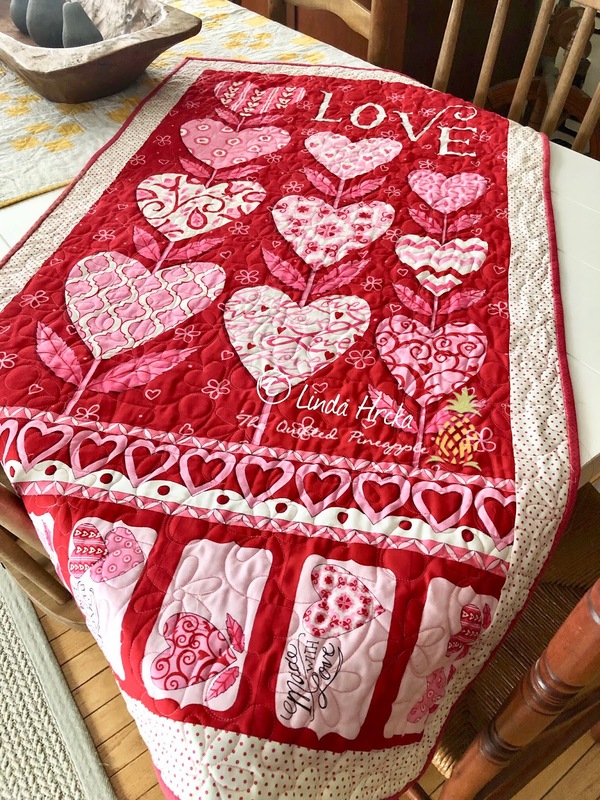 I machine quilted the pattern hearts and flowers. 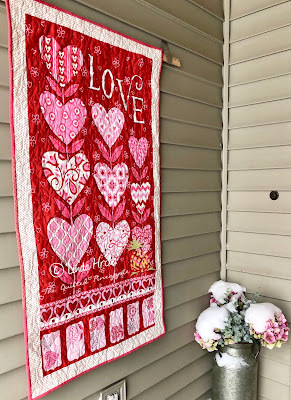 Normally, I am not a big quilted hearts and flowers quilting kind of gal, but it just matched this perfect! I used another leftover Moda fabric in the border from one of Alyssa's quilts and a leftover backing from another quilt for the backing. I used Innovatech Thread on the top...my new favorite, Magna-Glide prewound magnetic bobbins and Hobbs 80/20 batting. 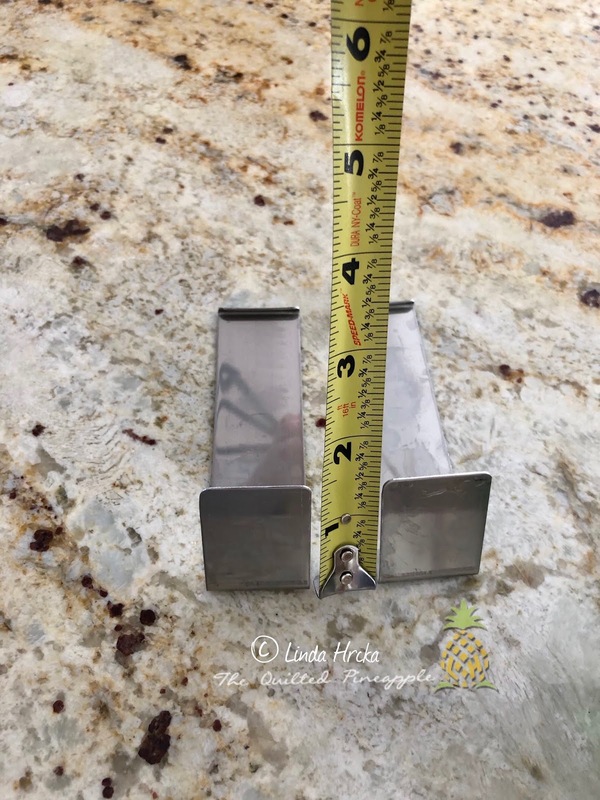 In honor of Valentine's Day, I am offering $14 off any order of rulers, templates or DVDs of $75 or more by using the code HEARTS on my website here. *Offer excludes machine quilting as that is already on special. Discount good through Feb. 17. I think I have blogged more in 2019, than I did the last few years. Cheers everyone! 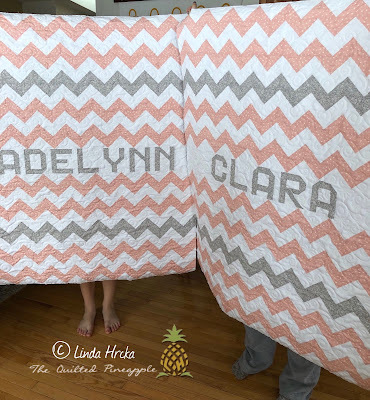 Okay, how stinkin' cute is this quilt?? Seriously. And it was fast and easy to whip up! So much so, I made THREE! I had a gift exchange recently and it worked out perfectly! I machine quilted them all up at the same time on the same backing which worked out great! Pattern is a freebie called Box of Chocolates from Temecula Quilt Co. here. The machine quilting pattern, I thought was a great complement to the design. It is called Clamshell Bokkusu. Speaking of machine quilting, I received a few questions regarding it. If you click on any one of the patterns here, all the info on pricing and such comes up. 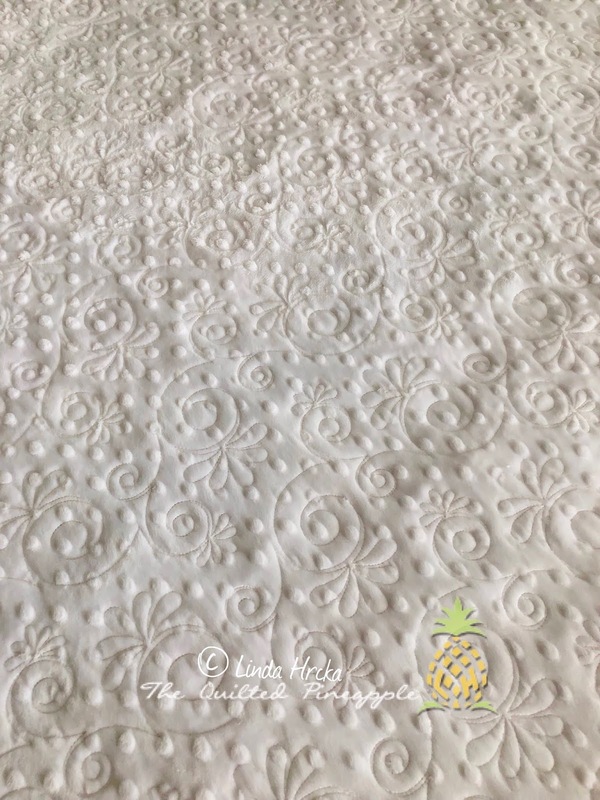 Also, you can find the info under INFO/Quilting services here. I typically leave the red and white/valentine's decor up through the month of February. 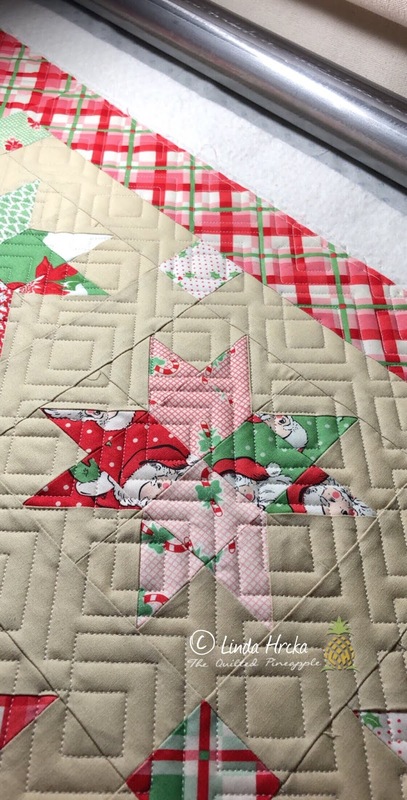 I do not think I'll ever put my red and white snowball quilt away. Thats a year around quilt for sure!! 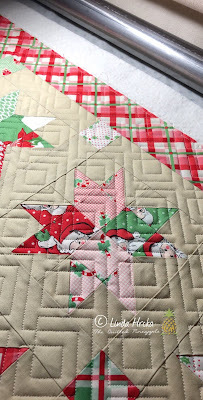 Pattern for snowball quilt that I loosely followed can be found here. Since after Christmas, I have a mix of spring and red and white. The Love pillow case is from Amazon and the H pillow is from Kirkland's. Red and white antique quilts. You can never go wrong there! Look at all those tiny hourglass blocks. I think they finish at 1"!! 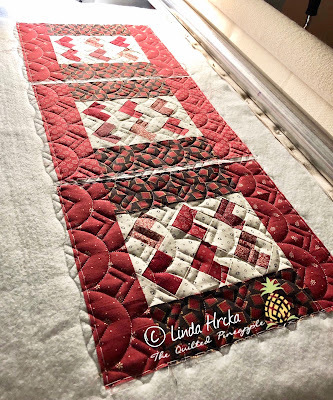 And that square in a square block quilt has 2" blocks! 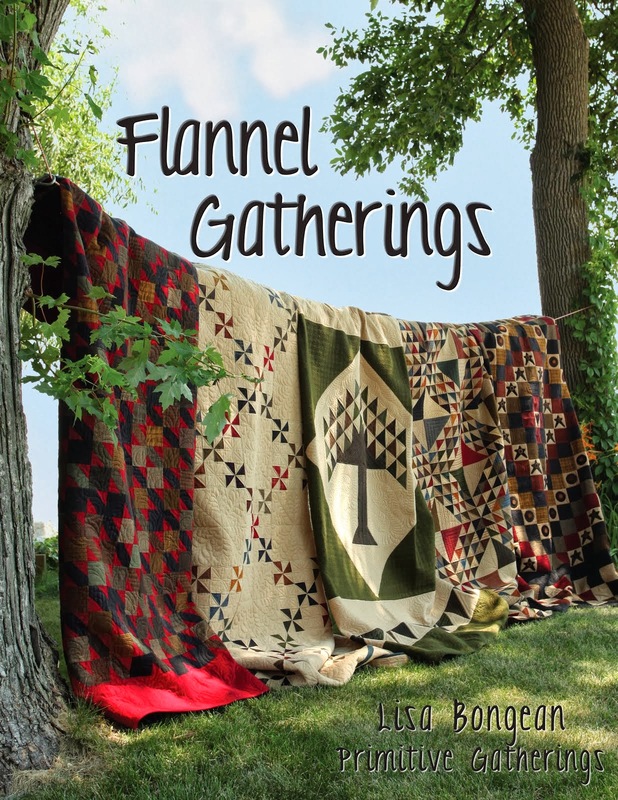 I feel fortunate to have stumbled across those quilts! Even a little nine patch hangs on my front door. 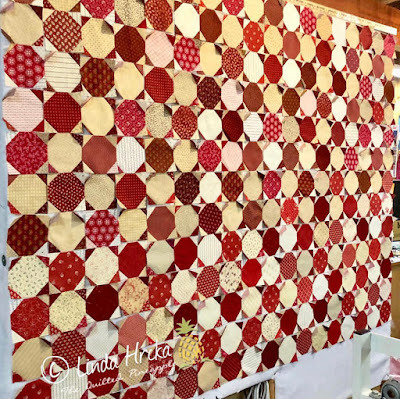 I have had a red and white snowball quilt on my quilt wish list to make since like forever. Finally, I did it! 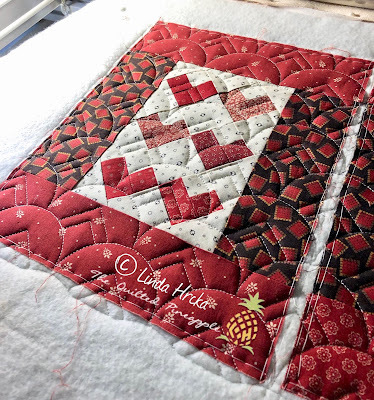 I started in February 2018 after Temecula Quilt Co. posted a scrappy snowball a-long, I decided to make mine scrappy red and whites. I could not be happier with how it turned out! I still need to add the binding. 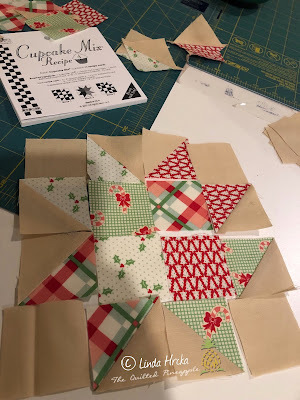 :-) I tried to make blocks here and there throughout 2018 with a goal of having it finished by Christmas. Well, that did not happen. I knew it was a lofty goal, but I was determined to not allow this to become another longterm UFO. So, I set my next goal to Valentine's Day, which I have all but made sans the binding, which I can deal with. If you have followed me on IG or FB, I have posted pics of progress here and there. Progress on my design wall. It was awesome when I was vacuuming my studio and I blew half of my blocks off...or not. 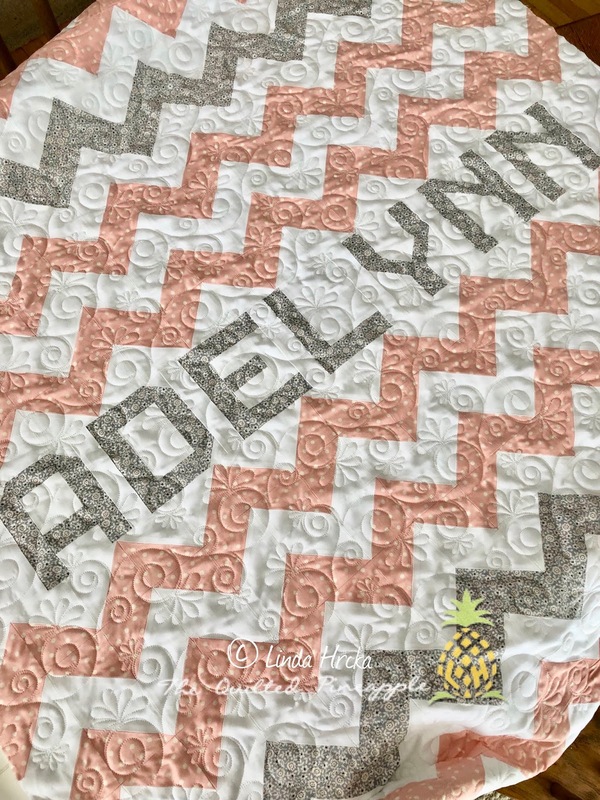 -I machine quilted on my Innova using the Sunrise Clam computerized pattern. I do offer computerized machine quilting at a special price here. -I used Superior's Omni thread on the top and Magna-glide prewound bobbins. Batting is a ton of leftover scraps.my quilt finishes at about 73.5" x 73.5". 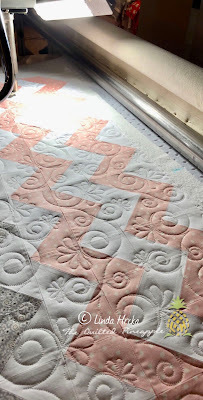 -I made my quilt 18 blocks across by 18 down. 324 blocks total, 1620 pieces! 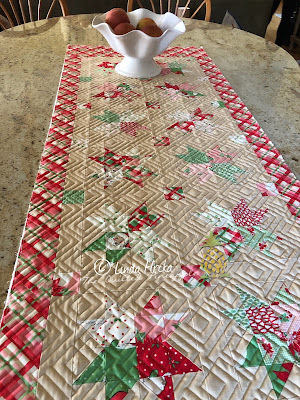 -I tried to use fabrics from my stash and scraps, but I did buy a few fabrics to add too. Naturally. Now to get that binding on! Happy 2019! 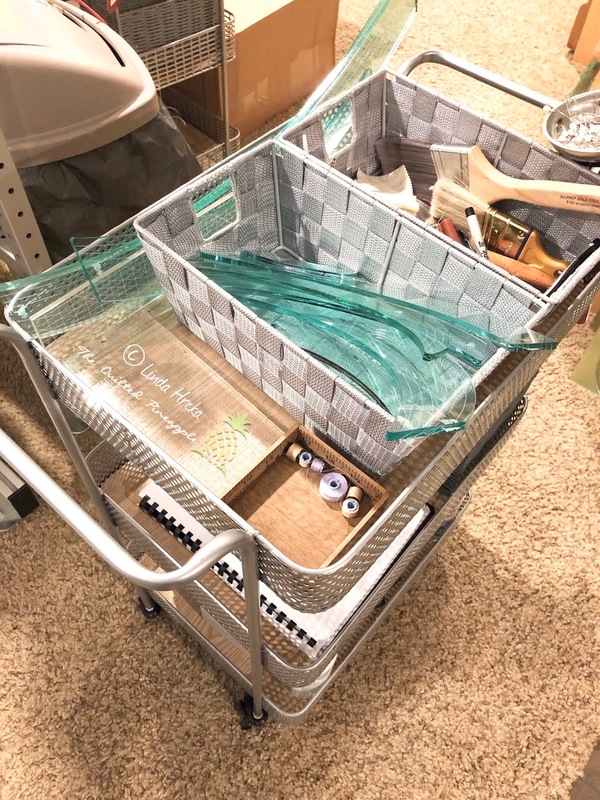 Long time no blogging! 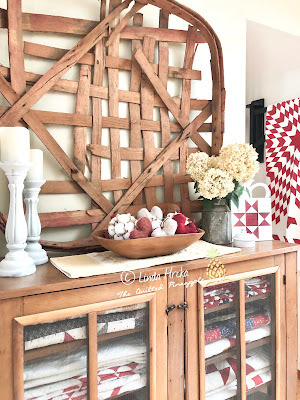 After much consideration, I have realized how MUCH I missed connecting and sharing on my blog. Yes, I have spent much time on Instagram and my Facebook page, but it is not the same. FB and IG have become impersonal forms of social media to me. 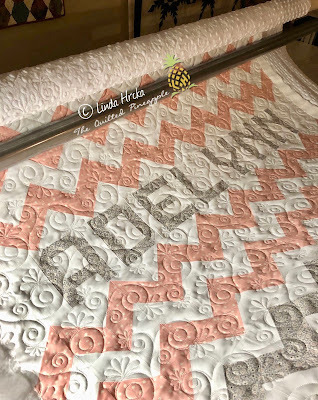 I once welcomed it, as I have always felt my blog was very personal because it was not just quilting, but a reflection of my life/journey aka piecing, working on projects, family, events, random daily things...AND machine quilting. Personal is not always easy for me. Some of you may recall from the early years of this blog, my dear Sarge (dog) was my profile pic for many years. Soooo, I am back to blogging more. YAY!! I am not leaving IG or FB, just adding blogging back too. FYI, My blog, I have noticed a few issues with the tab bar missing for example, although you can click on it, the tabs are "hidden." I will work on getting that fixed. Christmas came and went, as did 2018. I did manage to complete some projects of my own. Swell runner....oh how I love thee. 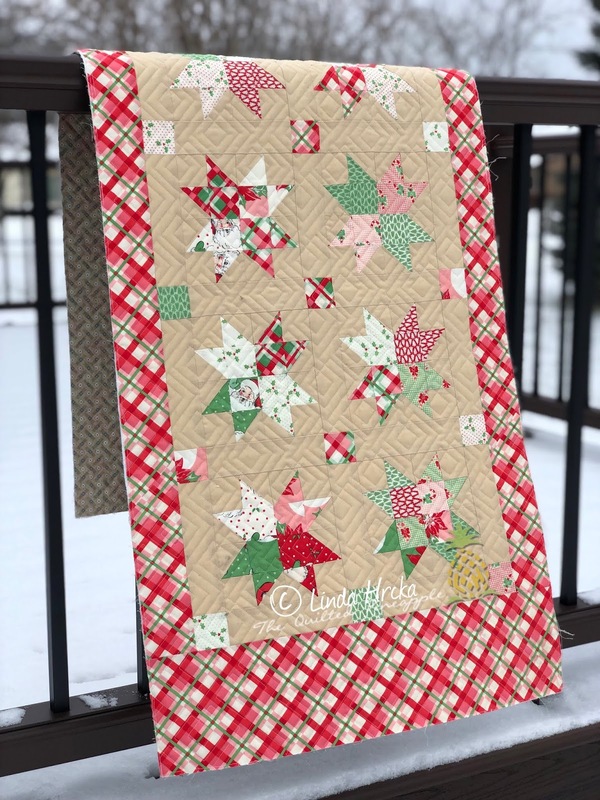 I have coveted (mini hoarded) Swell Christmas fabric by Urban Chiks for Moda since it's release. I love the retro look of it. I mean, how can you not love that Santa?? And remember, I never met a fabric I didn't like. 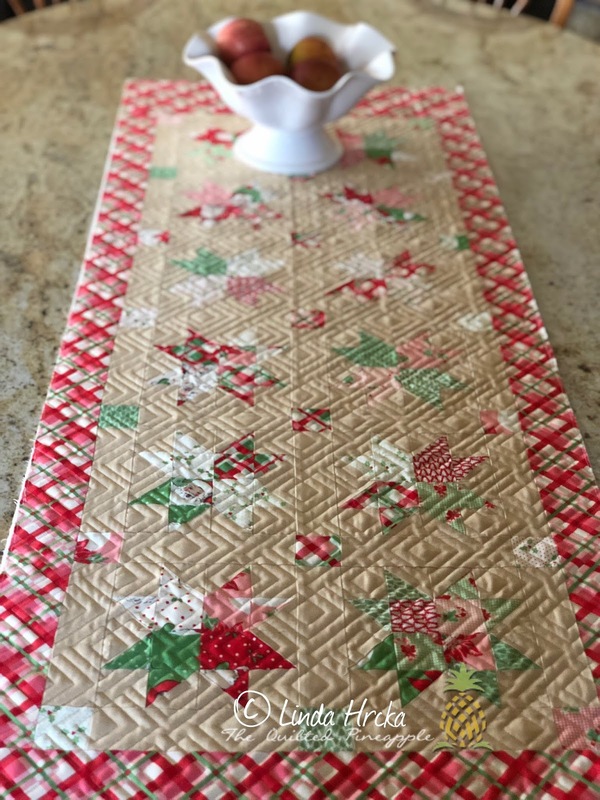 :-) I finally got around to getting a little "fix" by making this runner. I believe it measures 18" x 57" or so. I used one charm pack, some Moda Bella Solids for the background and some Swell yardage for the borders. 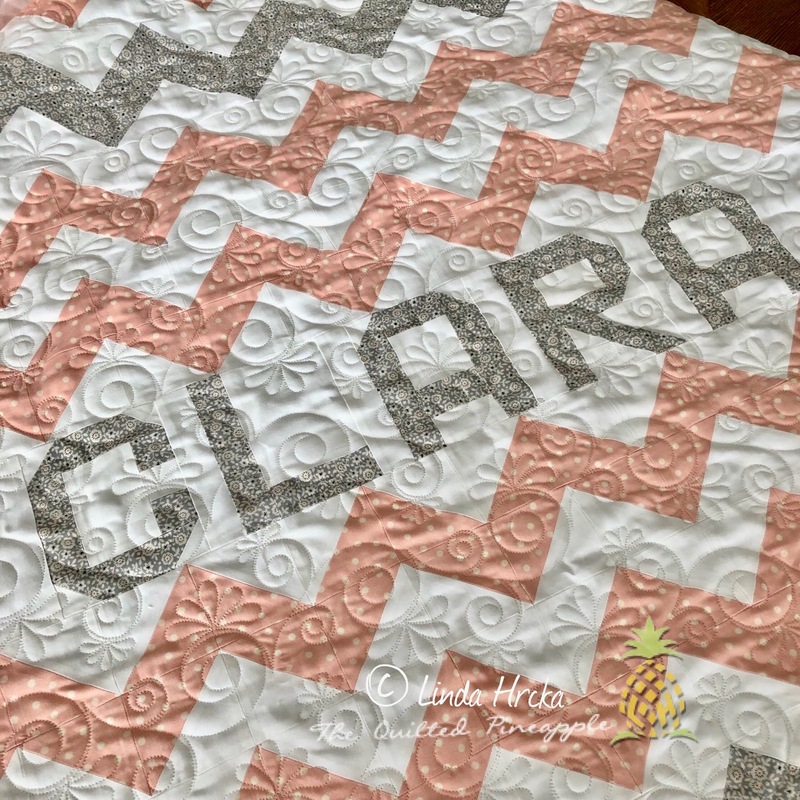 I used the Moda Cupcake Recipe Mix #4 from Genius, Carrie Nelson of Miss Rosie's Quilt Co. to piece the (gazillion) HSTs. 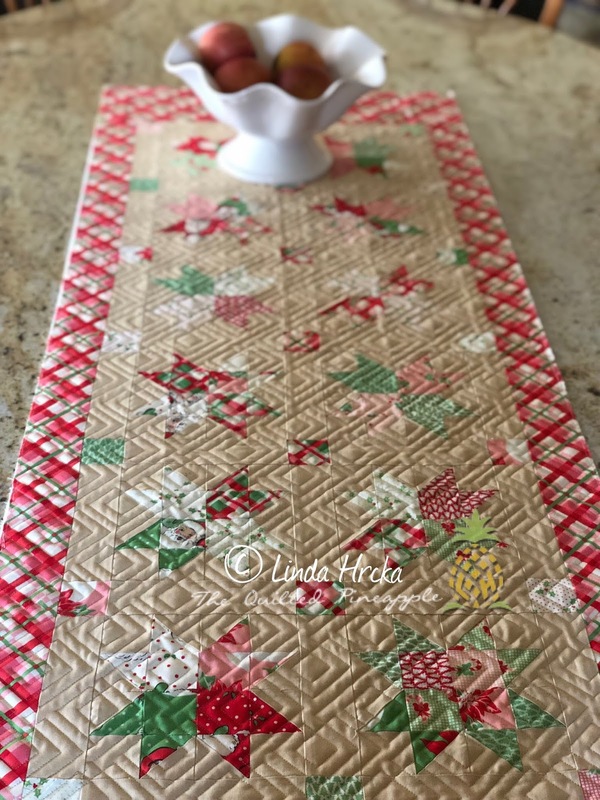 Pretty sure I can easily make another runner with the HSTs I have left over OR a mini quilt. Have you tried those Cupcake Mixes yet?? Oh my, super fun!! And yes, all my HSTs are not going in the right direction in the block photo, but I caught it before I stitched it up. I machine quilted it with an edge to edge on my Innova with the digital pattern called Squared by Leisha Farnsworth. I love this design on quilts! 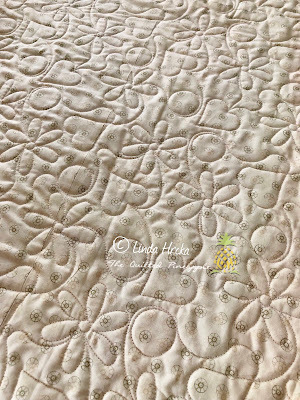 I just added it to my machine pattern library recently and I swear I have quilted it over a dozen times! 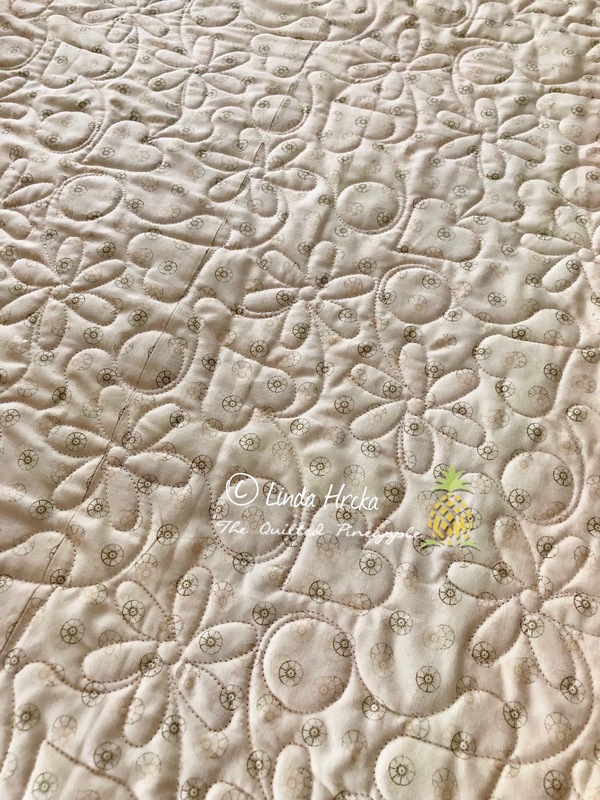 Also, did you know you can send quilts to me for computerized edge to edge quilting?? Oh yes! I am running a very good special, flat rate pricing with free return shipping! Check out the designs and details here. 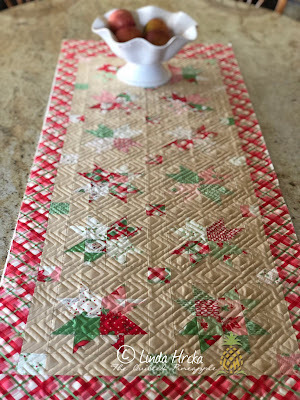 Also, in celebration of me blogging again, I have extended my holiday sale of my QP Curve Templates, Rulers and Quilt DVD, shop link here, through Monday January 21 2019. Regular prices will resume on Tuesday January 22 2019. NOT only that, I am adding a discount code for blog readers. Use the code BLOG in the discount box for an additional $10 off any bundle, set or DVD. Cannot be combined with any other codes or previous discounts. Here's to wonderful 2019...with more blogging, Friends!